For the past week I’ve been an international dog-sitter to a cute little guy named Ferdinand. On our daily walks through Vienna, I started to notice all the faces in the walls. Ferdinand, the opposite of my dog. He likes to sleep in, bark loudly at other dogs and stop frequently on walks, but cuddles lovingly. It might sound crazy, but do you ever have that feeling that you are being watched? In Vienna, you always are. Dramatic faces called mascarons are built into the walls above entryways, windows and adorned to arches or rooftops. Initially mascarons were designed to prevent evil spirits from entering the premises, hence some of the frightening expressions. At times I felt like I was walking amidst a collection of life sized dollhouses. You don’t have to walk far to notice that Vienna’s architecture is a rich range of new and old dichotomies; from Baroque-era designed architecture to minimalist 20th century designs. Of course there is a wide variety of architectural influences that creates the aesthetic of walking amongst “pastel painted dollhouses.” There are the Neoclassical, Jugendstil (Art Nouveau), Romanesque and Gothic architectural influences; as well as the notable works by Austrian architect, Otto Wagner. Mascarons can be found in architecture from many of these different styles with the depiction of beautiful women, gods and goddesses to grotesque demons and animals, usually lions. From symbolism to pure decoration, these dramatic expressions to emotionless, mask like faces are around every corner. When visiting the Belvedere Palace, examples of Baroque architecture can be found inside and out. The faces in the walls are seen in grandiose theatrics of tricky mirror walls, altered perspectives and illuminated surfaces with dramatic sense of light or chiaroscuro techniques. Then of course there are the faces on the wall, added by graffiti artists. Before visiting the city, I knew of the famous artistic geniuses linked to the iconic Vienna Secession, like painters, Gustav Klimt and his protégé, Egon Schiele. And of course the musical classics like Beethoven and Mozart. What I didn’t expect to find was the street art. Even the exhibition, “Vienna 1900, The Birth of Modernism,” at the Leopold Museum alludes to the history of Vienna’s street art or the “art gallery for the poor man.” I was surprised to find that Vienna’s street art dates back to the Vienna Secession posters. 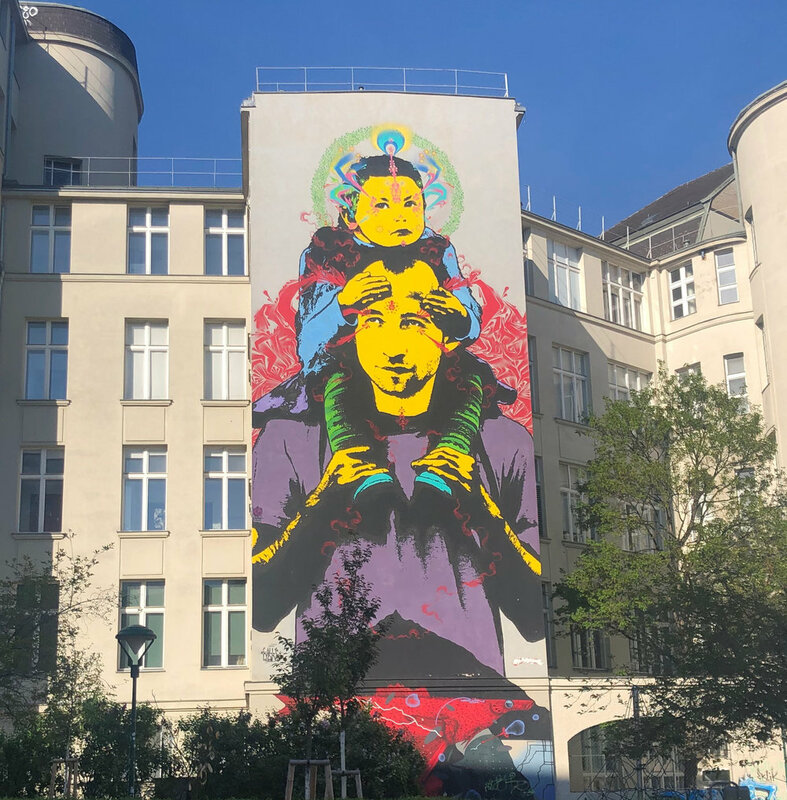 In fact art critic, Ludwig Hevesi coined the slogan, “Kunst auf der Straße” (Art in the Streets) with his article about walking through the streets of Vienna published in 1899. This saying can also be found transcribed on the facade of the Secession building. History lessons provided by adventures with Ferdinand in the city. Turns out dog walking can be quite educational if you want it to be. On November 6th, 2018, I moved from Seattle, Washington to Gonderange, Luxembourg. Even after six months that statement still feels strange to me. Maybe it’s the differences in living in a village in a country with a population less than the city of Seattle or maybe it just the fact that it takes time to feel like you live somewhere. The life I had in Seattle feels like it was years ago. It all happened quickly. We sold our house on a Saturday, packed everything else we didn’t sell on a Monday and left the country the very next day. I never thought I would live in either Seattle or Gonderange. I certainly never imagined myself in a village in Central Europe with a barn behind my house. Life is funny that way. I’ve found that most of the villages here in Luxembourg are all centered around a church. Mine is orange. Gonderange (Gonnereng in Luxembourgish) is a small village in the commune of Junglinster. When I tell people, where I live (this also includes some locals), I usually have to say Junglinster in order for people to recognize the area. Which makes sense, because the population of my village is less than 2k. Ok so I made this house super yellow even though in reality it is not. I promise there are houses that are this yellow, I just liked this building more. Strangely enough, living in the countryside of Luxembourg makes me think of my hometown in certain ways. I grew up in a suburban neighborhood in the south of Charlotte, North Carolina. Similarly, everything is clean, too clean, suspiciously clean. Like other suburbs I have encountered, there are your standard big houses, fancy cars, and well tended bike paths. I have found all of those things here; the details are just different - the shape of the windows, the patterns of the rooftops, the sculptures in the yard. Similar, yet different. What I love most about walking through my neighborhood, are the bold colors of people’s houses. Blinding reds to juicy oranges (especially midday, shining in the sun). Then there are the plethora of the pale faded pinks - the whole spectrum is there. All the colors I always thought you weren’t supposed to paint a house are there and I’m glad that they are. There is so much history here. In the old buildings, the renovated barns with tracings of past lives. To give you some context, the commune of Junglinster was first recorded in 867, during the construction of Bourglinster Castle. I’m fascinated by all those things that aren’t quite right or slightly askew, just as much as I am fascinated with circular cobblestone patterns that form a seamless design. Truthfully, I like having access to the quiet beauty of the countryside and it’s endless rolling green fields. The city is a short distance away by bus or car. Not to mention Germany, Belgium and France are close by when Luxembourg begins to feel too small. For now i’m pretty content taking in my new surroundings in places like the balcony overlooking the Alzette river at Liquid Café in the Grund neighborhood of Luxembourg City. A cold beverage and new friends like designer, Irina Moons (check out her work) are also a plus! Since I have lived here, I have also become aware that even if the beach isn’t nearby, Junglinster has surfing and salt cave options for you. If you want to workout by practicing surfing skills in someone’s garage, Challenge Your Balance is an option. Or if you want to sit in a man-made salt cave for self care, curiosity or other healing processes, Salzgrotte promotes itself as a treatment center that “feels like a day at the ocean.” So who wants to go with me? What kinds of things have you found in your neighborhood? A series of illustrated self-care attempts; a list of imperfect coping strategies inspired by the book, “More Misery,” by Suzanne Heller. Suzanne Heller calls out humor in childhood miseries, but let’s be honest adults forget about their chocolate too. Before moving abroad, I wrote down a list of goals to refer back to when I was having a bad day or felt too overwhelmed. Goal: Write down one positive thing a day. Reality: I washed my underwear, that’s positive right? Reality: I opened the door and thought about it. Reality: Why can’t I cook rice properly? Goal: Socialize at least once a week. Reality: I spoke with the cashier. Reality: Muddy footprints always appear right after I sweep and mop. Truthfully, everyone suffers with different types of sadness for a variety of reasons. For me, this list of goals, albeit trial and error, sometimes helps. When my expectations are not my reality, laughing at myself helps too. Let’s Talk About Mental Health also shares honest stories from around the world in an effort to alter stigmas associated with mental health issues. A series of red rooftops, a dwelling place’s top most height. My love language is handmade snail mail; Bob Beasley’s was sharing his stamp collection. Bob lived on the third floor of the same retirement home where Ms. Virginia once lived. Shortly after Ms. Virginia met Bob, she wrote me an email in all caps. I’m not sure if it was to express her excitement or if that was just how she wrote emails. While telling me all about Bob, she wrote, “he asked me to go upstairs to see his stamp collection, thats one I’ve never heard before.” Who knew stamps could ever sound so suggestive? Like Bob, my grandfather also kept a stamp collection. He never told me about it. I just so happened to find it one day. My mom doesn’t even know that I kept it, although once I post this she will. Sorry mom. The term philately is used to describe the study of stamps, but most likely you will be hard pressed to find a philatelist or stamp collector these days. Since it’s a seemingly dying art form, stamp designs and their histories are easily unknown - stashed away in books with disintegrating cover pages. Yet, before the prevalence of immediate communication via email, images designed for stamps were used as political strategies. Some stamps were said to have had the power to divide nations. Others may have been carriers of secret messages, sticky with propaganda. Great Britain was the first to create a stamp. Her name was “Penny Black.” Before her creation in 1870, thousands of letters were mailed and never opened, words never read, because the recipient was often unable to pay for the postage fee. In all honesty, I probably wouldn’t have paid as much attention to stamps, if it weren’t for participating in a postcard exchange for a year. Every month I bought stamps to send out a batch of handmade postcards into the world in exchange for a new collection. Lucky me, I found some summer sweet treats in the form of scratch and sniff popsicle stamps. Do you still send out old fashioned snail mail? I’ll admit, I didn’t know there was a word for defining a collection of passages written in books, until I visited the exhibition, “Ann Hamilton: The Common SENSE,” at the University of Washington’s Henry Art Gallery. My favorite type of commonplace book is the kind that has a strap to keep your pages together, useful for when they start to become unbound. They also have one of those convenient ribbon bookmarks attached. And the really good ones have a pocket or envelope in the back, to keep important findings. I’ve been collecting and receiving pocket sized note books for as long as I can remember. The style of the book often reflects various phases in my life or places of travel. My favorites are either gifts from friends or come from places that have provided inspiration, most of which are museum gift shops featuring artwork from a select exhibition or an artist crush. These note books are markers for pivotal passages, recounting and recording words from strangers or people of personal connections. Essentially, commonplace books are the art of list taking with influential ideas; made up of words behind bullet points, in between a lot of quotations and completed with proper citations. Add page numbers if you need to refer back to the original text. I’ve gotten better with this as I’ve gained practice. My commonplaces often serve as sources for my artwork; from the symbolism in the slow but steady coming of age story, “A Tree Grows in Brooklyn,” to the late photographer, Diane Arbus’ accounts of visiting a nudist camp. Sometimes I stretch what defines a commonplace to words attempting to record a visual image. These can be quick notes about an idea or descriptions of a fleeing moment; photographs I didn’t take or paintings I never made. Some of these commonplace books recount the humorous and honest childhood tales of people who have left a lasting impact, like Ms. Virginia Short. Our unsuspecting friendship began when she was in her late 80s, working her last job, and I was in my late teens, working my first job. I followed her around the card store, furiously writing down anything she would tell me. She was spunky and sharp with a remarkable knack for somehow being able to smile, laugh and scold simultaneously. I was too slow of a note taker and lacked her short hand talent. Let me just start by stating the obvious, living in a country with three main languages, non of which you speak, means that you are predictably going to make many mistakes. I frequently have to remind myself that failure is the best way to learn. 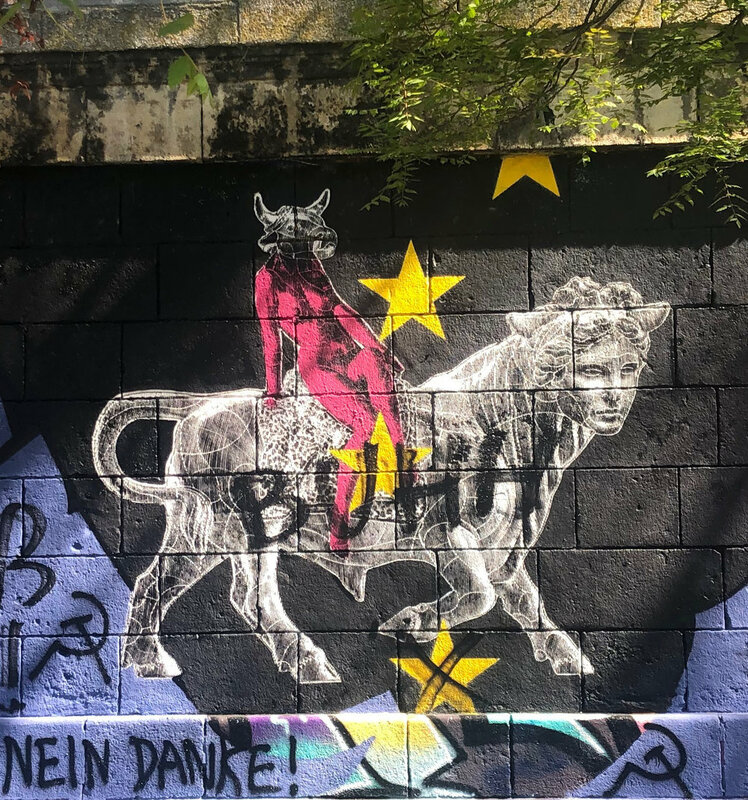 In an effort to make the most of my circumstances, I have illustrated a collection of humiliating expat experiences for you to visualize and share in my laughter. My neighbor (who primarily speaks Luxembourgish) was very concerned that I was using the bushes that divide our backyards as a backdrop. Let’s just say, I have very attentive neighbors. *Disclosure: Not all of these are my own experiences & for the benefit of others they will remain anonymous. Also, don’t drink any liquids and read these. From my recent experience of visiting doctor’s offices (from general practitioner’s, to medical clinic’s or veterinarian’s offices), the doors aren’t always labeled and it’s not always clear where you need to go. I’ll admit, I’ve sat in the wrong room or opened the wrong door. However, I’ve never gone to the wrong building or entered someone else’s private residence. Although, I think it’s safe to say if you are going to see an ophthalmologist, you most likely don’t have the best eye sight. So it might be a common mistake to walk into and up the stairs of the poor stranger’s home that is inconveniently located next to the eye doctor’s office. Well, that’s what happened to a person I’m going to call Stuart. Let’s just say doors were locked after Stuart left. I recently signed up to take a French class. People have asked me how do you decide which of the three main languages to learn. To me, it makes the most sense to begin with French, because it is used most frequently in official documents and in restaurants and grocery stores. One of the requirements to register for a class at the Institut National Des Langues is to take a test and make an appointment. I took the test online, which proved I am a beginner. It didn’t occur to me that the appointment would also require me to speak French. When I was asked to describe myself, I froze. I get nervous and embarrassed attempting to pronounce French in public or to a fluent speaker. All that came to mind was, “Je mange une pomme,” (I eat an apple). I’ll explain. While I have been waiting to enroll in a class, I’ve been trying to teach myself French with a free language app called Duolingo. The first few lessons on the app only talk about f@#*ing apples and oranges. I guess it works, because in a panic - it was apples that came to my mind. Getting my mail makes me anxious. I get nervous when I see envelopes that are addressed from Le Government Du Grand-Duché de Luxembourg. Trying to decipher my bills from French to English is my least favorite. I also have to pay more attention to dates. When you initially make the mistake of reading 2/1/19 as February 1st instead of January 2nd then you have to translate more documents that begin with "rappel de paiement." By the way, majority of these stories have to deal with food. I thought that if I went to Ikea, a familiar place, I would be able to order and receive the food I actually wanted. Well, think again. What I thought were the standard Swedish meat balls were in fact, fish balls. Do you have any idea what you want? In another attempt at ordering food, this time at the the local butcher, I worked up the courage to memorize a phrase in French. I had just received some of my old recipe books and wanted to make a stew. When I got up to the counter, I asked, “Une coupe de lampe s'il vous plait.” She looked at me strangely and repeated what I said in a surprised voice. I looked up to see what she was pointing to and realized, I had misspelled lamb as lamp in my google translate app. Then there are times when you just have to get creative. You realize ahead of time that “a top” is “un haut” in French. You know that you are incapable of producing the correct sounds to audibly pronounce the word you need, so you try something different. For example, you try “ un chapeau pour mon café s'il vous plait.” Tops are really just hats for coffees, right? In hindsight maybe trying to translate the word “lid,” might have been another good solution. 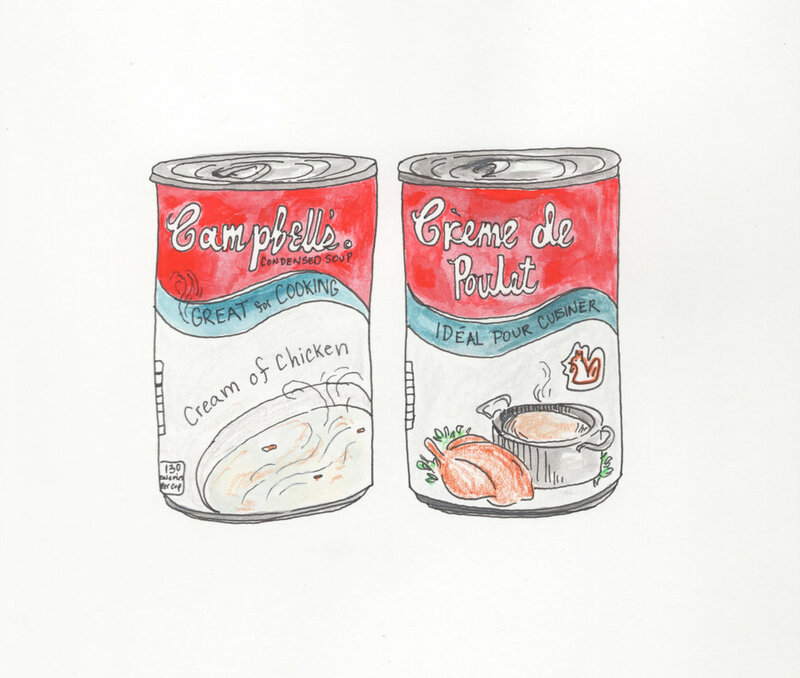 What is the French version of Campbell’s Soup? Trying to cook the same meals I used to make in the USA can be challenging. You can’t find ground turkey. You also cannot find cream of chicken. The first attempt at making my own version of cream of chicken for my husband’s favorite casserole, went horribly. I am going to attempt to try it again for Valentine’s Day. This can only go one of two ways. Since moving to Luxembourg, I’ve found it challenging to find specific art materials here. 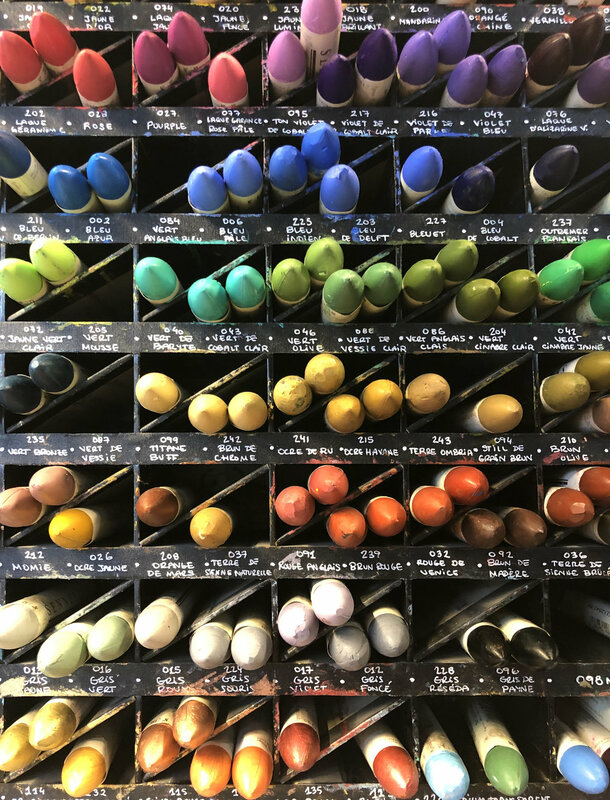 So when I took a trip to Paris, I focused an entire day on researching and visiting art supply stores. After all, the paint I was looking for, flashe vinyl water based paint, is produced by LeFranc Bourgeois, a French company. The first art supply store on my list was, Magasin Sennelier. 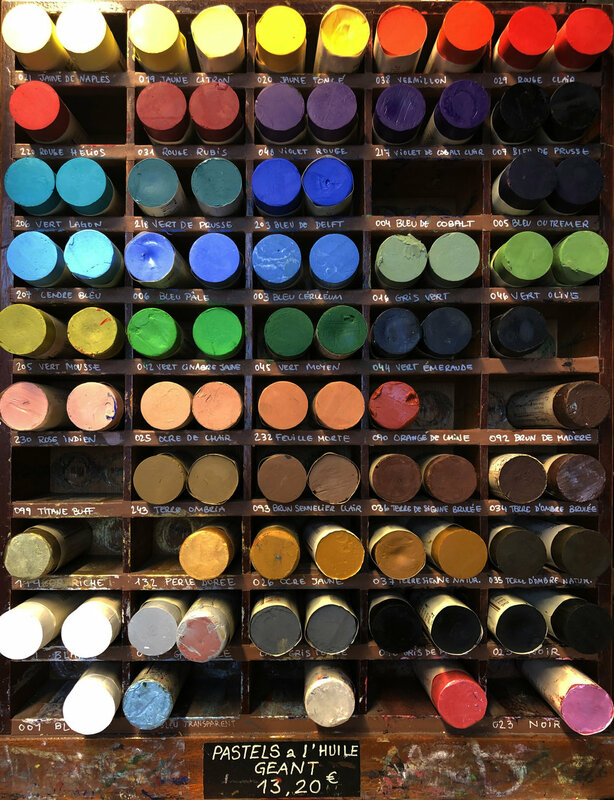 There is history here; both in the collection of renowned artists who have sourced their supplies from these very shelves, as well as the origins of the vibrant pigments being sold. Like Paul Cézanne, Edgar Degas, Pierre Bonnard, Èdouard Vulliard, etc. etc - I was going to Paris for paint. It may sound romantic, but the reality of carrying around heavy and often awkwardly sized and fragile supplies is not. This Parisian art supply store, located conveniently near both the Louvre and L’Ecole Des Beaux-Arts, opened its doors way back in the horse and buggy days of 1887. It was here, that founder & chemist, Gustav Sennelier began producing and developing his own line of pigments. Luckily for me, the Sennelier store is still just as viable today as it was then. 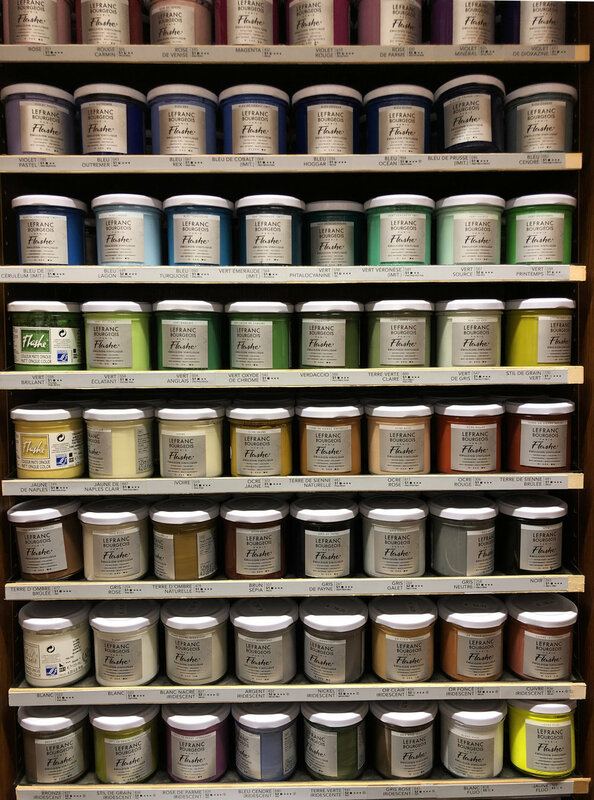 I am happy to report that not only was I able to find a pleasingly organized wooden rolling shelf system, but also rows and rows of glass jars filled with my favorite paint. Researching sources of specific colors continued past the doors of art supply stores. Walking around with jars of paint made me notice the many colors and designs of doors found throughout the streets of Paris. How many doors in Paris can you document in one day? In playing the game of “how many doors can I document in one day,” I began to notice a pattern. Many Parisian doors are blue. (FYI: There is even an entire instagram account, @bluedoorsofparis, dedicated to blue Parisian doors.) So why blue? Maggie Nelson loved blue so much she wrote an entire book about it, Bluets. My green purse matching the green door. Tags parisian doors, the secret lives of color, color histories, green, blue, which green do you believe in? No, I didn’t steal my grandmother’s spoons, but I did steal the idea from her. Sitting in her kitchen, I always wondered where they came from, why they were grouped together and what made them special enough to be on the wall. I decided to answer the questions, I never asked by collecting my own silverware. I’ll admit, most are stolen and some are gifts. I don’t condone stealing, and part of me always felt bad for taking what wasn’t mine. In hopes of forgiveness, I would trade something in it’s place, usually an “act now, ask for forgiveness later” in the form of an extra tip. I never found a spoon when I was in Vancouver. You don’t eat raw oysters with spoons. When in Rome, cafes are great places for people watching while waiting for your train. I nicknamed him Mr. Spoonman. He was sick and passed the time by painting spoons and giving them to people he liked. I was most excited to explore Vík í Mýrda but it rained the entire day. It was the kind of rain that hit you from the side and poured out of your boots. Waking up in the capitol of Cambodia. The happy feeling of sun on your face and feet on solid ground after 24+ hrs of travel. I knew I married the right man when he surprised me with a stolen spoon after I told him my secret. He proposed to me in Paris, even though I was unable to order breakfast in French. We drank coffee watching the sun rise over the temples of Angkor Wat. Bangkok was the best and worst of times with the fanciest of hotels. We drove to the beach on a rented motorbike. He navigated on a different side of the road and I held on and closed my eyes.